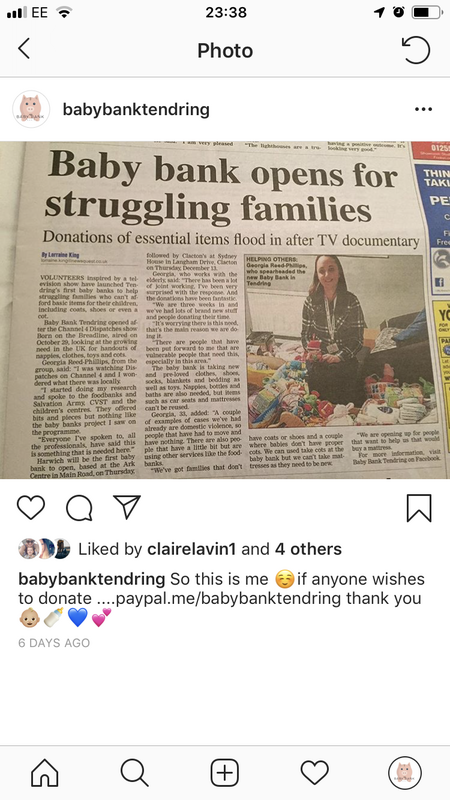 Georgia has recently set up Baby Bank Tendring and is currently collecting donations and then distributing pre-loved and new items of baby clothing up to 5 years and equipment to parents/ carers in the local community who need this service and who are referred to Baby Bank Tendring. There are four hubs set up over the Tendring area including, Harwich at The Ark Centre, Sydney house in Clacton working with the Barnardos team, Jaywick with Inclusions and Walton at the local community centre. Georgia will be visiting these hubs once a month to provide the service to those who drop in and will also offer the service to those who have contacted Baby Bank with specific referrals.She is also working with Les Nicoll on the winter warmers project and the Christmas hamper project this year. Tendring, Georgia Reed- Phillips, Susan Welsh and Sarah Edwards. Their backgrounds are in teaching, community support, care and housing. We have public liability insurance, current DBS checks and can provide references and any other additional information that is required. We are not a charity we are simply three individuals who are looking to support the local community using skills, our time and experience to hopefully develop something that is a success and benefits the local community of Tendring. After being inspired by the Channel 4 dispatches programme showing the amazing work being done for local communities around the country offering a baby bank service they did some research and Baby Bank Tendring was born! Who are they giving items too? You will be gifting your pre-loved items to parents/carers and children in need in the local community. Baby Bank take your donations and forward them to those in need that have been identified and meet the criteria. Anyone can refer! They are here to help! All they ask is for name, address, proof of benefit and a signed form we have that states that the items given are to be used for that family identified and that baby bank are not responsible for them after gifting.The form will also list items that you have had from the service. They also abide by GDPR, safeguarding, confidentially and duty of care, and Baby Bank Tendring are here to help and will not tolerate any abuse of any kind and will contact other agencies if required for different support needs. Baby Blankets/ Towels/ Dressing gowns. Moses baskets/Cots/Bouncers with brand new mattresses. There may be other items that are needed for specific referrals. They can no longer take mattresses (unless brand new) or car seats due to health and safety nor prescription milk, medication, milk or any food items. They have had and are in the process of meeting groups and organisations in the local community including: GP surgeries, midwifes, social care, supermarkets, Barnardos, fire service, mother and baby groups, local schools. salvation army, CVST, and Foodbank to name a few as well as established baby banks from across the country. Donate items pre- loved or new. Donate money via our paypal: paypal.me/babybanktendring. With this money they can purchase NEW items such as mattresses, new bottles and specific referral items. Donate vouchers – they can then use these for referrals to buy brand new items. Share their posts and our group. Recommend us to people or let us know of any organisations in the community that could help us! We are also working on an amazon wish list so people can purchase items directly. How to contact Baby Bank? Please be aware that we are all Volunteers and we endevour to get back to you in a reasonable time frame. Please join our group ‘ Baby Bank Tendring’ on facebook for live up to date information. They also have instagram- Baby Baby Tendring. Please feel free to contact Georgia for anymore information or if you have an advice, donations, or contacts to share!